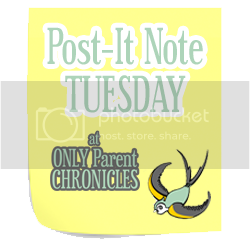 Only Parent Chronicles: Return of Post-It Note Tuesday! Return of Post-It Note Tuesday! Once upon a time, this was a thriving space. This is my first time linking up :) Thanks for hosting!!! YES! *fist pump* I have seriously missed these. Missed them so much I now have a whole drawer full of post it notes in the house and half of my refridgerator is covered in post its I've drawn on and written on and stuck in Lil Duck's lunch box. I am smiling like an IDIOT over here...I have missed you. I used to do this meme and LOVED it! Glad to see it back again!! !